On Thursday Bones will air its 200th episode, which by all accounts is an achievement all by itself. However, to mark the occasion, the cast and crew put together the hardest episode creatively, that they’ve ever done, according to Bones boss Stephen Nathan. Following in the style of iconic filmmaker Alfred Hitchcock’s movies of the 1940’s and 50’s “The 200th in the 10th” is an homage to the glamor of 1950’s Hollywood, and an opportunity for the cast to makeover their characters in classic style. 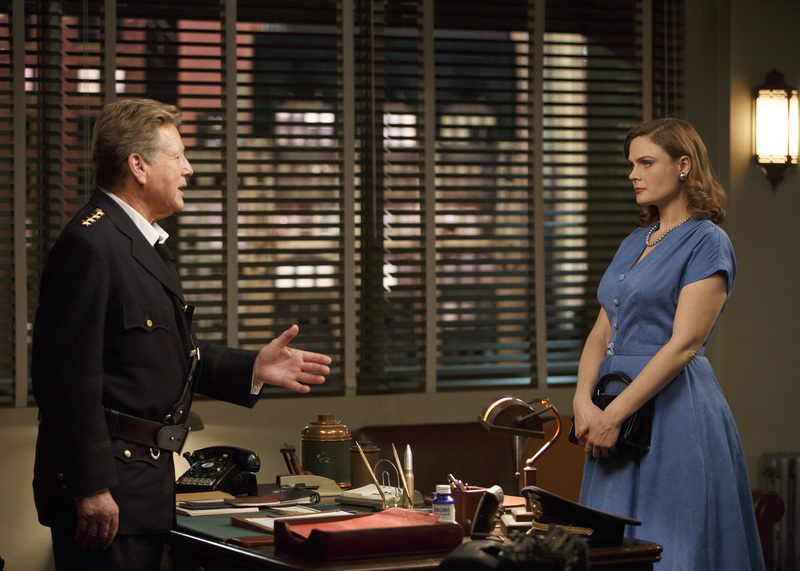 Following our advance preview of the visually stunning 200th installment, ScreenSpy sat down yesterday with Stephen Nathan to talk a little more about this landmark episode, plans for an 11th season, whether Bones star Emily Deschanel’s pregnancy will be written into the storyline this season and more. Catch full highlights from our call below. Personally, I’ve always loved Hitchcock so it was just a dream to do this style. The specific films – we reference them mostly visually – are To Catch a Thief, North By Northwest, some bits of Notorious and The Man Who Knew too Much. We just really culled the library of all these great Hitchcock films in order to drop those little things in. What we didn’t want to do – and hopefully we avoided – was do an episode that was just a wink and a nod to those things, and also where the episode had to rely on costumes, props and cars. What we tried to do was do another great Bones mystery, and a story that existed and was sustained on its own merits, and was cloaked in the style. I think we did that. David Boreanaz did a remarkable job directing this, and really carried forth this vision that the story was the most important thing. We wanted the audience to go, “Well, who did it? Oh my God, that’s an interesting twist!” rather than “Oh, there’s another car. Look at their clothes now.” I think David really directed this by walking that fine line perfectly. The network really doesn’t like smoking, and certain things have changed since 1954. In 1954 there were ads about the benefits of smoking, where you saw doctors tell you that it was good to smoke. I think we wanted to get away from that. It would’ve been nice to have someone smoking, but it really wasn’t that necessary. I think that time was really more about, at least for us, knocking back some dry Martinis rather than trying to contract lung cancer. We certainly have been talking about an eleventh season. We’re ready to do whatever the network tells us to do! It’s all up to the network. The network and studio have to get together to decide whether there will be an eleventh season. All indications are that there probably will be, but you never know until you know for a fact. We’re just going to keep moving forward. Hart and I have talked about this before, and if we have to end it, we’ll end it, but it doesn’t feel as if it’s ready to end. I’ve been doing this for a long long long time, and I’ve never come close to ten years. Ten seasons in the beginning was an inconceivable thought. When we started with the first 13 episodes we didn’t know if we could have enough stories where we could be solving murders using bones, and here we are 200 episodes later still doing it and still finding new things. I don’t even know how that happens. The show has a lot of life in it. It’s not boring for us to do. We don’t come into work and go, “Oh God, what now?” We really come in going, “Hey, we can do this or this or this?” We’re still excited about doing the show which is remarkable in and of itself. We just keep finding worlds that we haven’t explored before. We have a remarkable group of writers, led by John Collier, who continually come up with new and unique stories and worlds and science. The one thing we have going for us is that in the past ten years science has really done a lot of good new stuff, and we get to take advantage of all of that. The forensic world is changing and allowing us to look at our crimes in a different way. And if we’re open to the relationships as living, breathing things, the relationships take us in new places that we haven’t seen before and just keep having a life of their own. It’s kind of staying open [to ideas] and not trying to keep this show in a box, and I think that’s why oftentimes you don’t really know what the hell you’re going to see on show. You don’t know whether you’re going to be laughing or if you’re going to need a box of Kleenex. As long as we can keep that going, I think the show has a tremendous amount of life still left in it. We’re still talking about that. It’s very difficult to hide a pregnancy. We could have her stand behind desks and drawers and things like that, but I think people know. [laughing]. The show is as much about their relationship as it is about solving crimes. This is what happens to people in relationships. People who have children sometimes have more children. It’s served us very well before, and I think it will be an interesting new wrinkle in the show going forward. I know there will be people who violently disagree, “Oh no! I didn’t like the baby before,” but there are people who always disagree and others who agree. It’s a lot like life. There are many many different twists and turns in people’s lives, and some people watching from the outside like some and dislike others. The ones that are disliked by them are liked by others and vice versa, so we just have to keep going forward in way that’s seems truthful to us and hopefully enticing and enjoyable for the audience. That’s our job. As much as we listen to the fans, we can’t be ruled by the fans. We can only love the fans. We wrote it like those films. I know those films quite well. It’s like music. It’s like the difference between writing a song today and writing a song that was written in the ’40s or ’50s. There’s a different musical quality to it. There’s a different music to the dialogue, to the rhythms, to the types of words, the cadence, everything. We just did our best to capture that. David and I talked for quite a while, although David got it right away, that this couldn’t be a Saturday Night Live sketch of a Hitchcock movie – or any other movie from 1954 – because that would become tedious in about two minutes. David understood that this had to be done with the same sense of truth that’s required to do any Bones episode. We just tried to write it so the rhythms were there, the dialogue was there, and the slang was appropriate, and then the actors just got it. Even Emily’s rhythms, – the ever so slight turn of her accent – everybody found the same reality, and it just worked great. [The cast] just had a fabulous time. They’re actors, and they got to be in the same show playing different characters with different clothes. It was just so much fun for everybody. Everyone, and I hate to say it, knew it in their bones or had done research, and just relished playing this new style. In it’s essence, in it’s very, very nature, it was Bones. What we were celebrating after 200 episodes was Bones itself, and the 200th still had at its core what Hart [Hanson] created, what made this show so enduring, which is its essence. Catch Bones “The 200th in the 10th” Thursday Dec. 11 (8:00-9:00 PM ET/PT) on FOX. Follow @ScreenSpy on Twitter for more breaking Bones scoop and interviews.